Years ago, as a deaf person, I didn’t believe I could travel on my own around the world so I put everything off. I didn’t really have anyone to look up to giving me that confidence that, yes, you can travel on your own without any limits. Thanks to many bloggers out there, I was able to take the plunge and book my flights. However, what about people who are deaf or has hearing loss? Are there any advice for them to stop them being in my position all them years ago? There are so many deaf bloggers out there who have that advice for travels and more and I want to interview them to crack them open for their rawness inspiration of travel inside. For this interview, it has been a huge pleasure to talk to Deafie Blogger. Ellie is probably one of the best deaf bloggers out there and I have met her a few times through campaigning and also at deaf events too! She’s leading the charge for subtitled screenings at cinemas in the UK and I simply cannot wait what’s next for her. Meanwhile we talk travel. 5. Where are you originally from and where are you now? Born and bred in Norwich, and have lived there ever since! 7. Tell us about your blog. What makes your blog unique from all the other bloggers out there? I write about my life as a deaf person, the experiences, challenges and barriers we face, and how we overcome them. My blog is honest, talking about my personal experiences, and hoping to change things for the better. 8. Why did you start writing a blog? And did you find it easy to set up? I was frustrated with the challenges that I faced due to my deafness and I wanted somewhere to express my thoughts so my deaf boyfriend suggested writing a blog and Deafie Blogger was born! From then I got lots of positive comments from others saying they could relate and it motivated me to write more! It was easy to set up, just went on WordPress and created it from there. 9. If you had to travel with 3 other deaf travel bloggers who would they be? Being Her Twins, Stacey from Deafinitely Wanderlust and yourself! 10. What’s the best advice you can give for deaf travellers? 11. Other than a job, what’s the easiest way to make money for travels? Not sure, other than working hard! 12. Where have you been in the world? And which was the best, worst, funniest, most random and scariest for your deaf experiences? I’ve been to quite a lot of countries in Europe, America a few times and Africa! The best… probably Florida for the theme parks and swimming with the dolphins! I loved Malta too it’s such a cute little country… I can’t pick! The worst, no worse places but accessibility wise will have to be when my deaf boyfriend and I went to Texas. I booked special assistance and even though we walked up to the desks in Dallas and San Antonio, all of them brought us a wheelchair even though they could see we could physically walk. They couldn’t get their heads around the fact we were deaf and the support we needed! We explained, we can’t hear announcements and we want to be taken through from security to the plane but they were awful, shouted and spoke to us like we were 5 years old! It’s put me off booking special assistance but we need it in the bigger airports in case we miss anything important. 13. What equipment do you use to support your deafness when you’re travelling? My phone, can’t live without it! Lots of handy apps, communication methods on there. I also have a vibrating travel alarm clock, and a personal safety alarm (which you set off if you feel you’re in danger). A portable charger to charge your phone! Luggage! Backpacks are heavy and it’s a pain when you’re trying to find something easily! But if you’re going backpacking then…? 15. 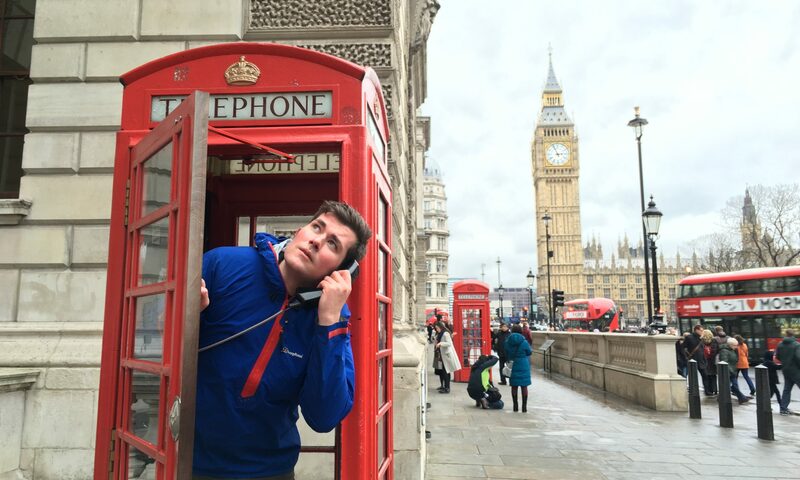 Top 3 items that you would love to see invented to support your deafness when travelling? a) Interactive boards in all airports, train stations, anywhere which has important information including platform changes, written announcements etc. c) An app which has all live transport on it, say Bus Times/National Rail/Airport & Flight Radar all in one! So you can see times, platforms, changes, even booking facilities? Requesting assistance facilities? That would be amazing! 16. Skydiving or Bungee Jumping? Skydiving all the way! I’ve done two skydives, and would happily do it again, bungee jump, no chance! 17. Best travel idol (aside from me, of course) that you would want to sit next to on the plane? 18. Hostel, Guesthouse, Hotel or Couchsurf? Hotel definitely, not had many good experiences at other places! 19. What deaf awareness would you love to see in accommodation? Accessible contact methods other than phone, written information which answers any potential questions, flashing fire alarms, people speaking clearly, paper at hand in case need to write something down. If you know some sign language that’s even better! 20. Day Trip, Backpack or live? UK, New Zealand or Vietnam? Backpacking sounds fun, but I like taking a suitcase! But the idea of seeing more than one place while away is amazing. I’d love to visit NZ! 21. Lonely Planet or Rough Guide? Lonely planet! It’s great for finding special scenic places that aren’t heavily tourist populated. 22. What resources do you use to help with your travel planning and what do you use to find out a destination/tour company is accessible or not? Online, or through a travel agent. Just read all the reviews, good and bad and look at different websites even if it’s for the same place. There are some accessible holiday websites but usually these are targeted for physical disabilities than sensory. 23. How do you find communicating with travellers on the road? I struggle with accents, and if they’re speaking a different language it’s also hard to lipread if you don’t know the words. Usually the person I’m with can hear what they’re saying, if not I’ll get them to type it on my phone or write it down! 24. Would you go on I’m a Celebrity and eat pig’s testicles? No..! I don’t see the point in that programme and why would I eat that! I have eaten crocodile and ostrich before and they were different, but nice! 25. How do you stay connected to your loved ones back home? FaceTime or Skype to video call, if not Facebook messenger, WhatsApp or text! 26. Which 3 songs have you played the most on your music device on your travels and how do you listen to them? I use my direct input headphone leads, but if I remember I can use my com pilot but it involves charging it up and wearing it around my neck so I prefer the leads, but they get tangled! If only there was a way of streaming music directly to hearing aids without anything extra! 27. Have you travelled on your own?, how did that go for you and did you find it easy to make new friends on the road? No I haven’t and I probably won’t as I love traveling with other people! 28. What are your next travel plans? Next summer, I am going to Sri Lanka to volunteer in a Deaf school for two weeks! I’m so excited! 29. What’s the best advice you can give to first time deaf travellers? Plan where you’re going, always ask if you’re not sure about anything, tell people where you’ll be in case of an emergency, explore new places and have fun! 30. Finally, tell us a funny travel story about your deafness? When I’ve been abroad and requested assistance for my deafness, and I specifically stated what help I needed, they brought me a wheelchair! What part of I’m deaf = my legs don’t work?! Even if I walked up to the special assistance desk?! When I said I didn’t need the wheelchair, they looked at me weirdly, as if they didn’t know how else to help me. It’s not much fun walking alongside a wheelchair with loads of people staring at you! If you would like to have an interview, please drop an email to thedeaftraveller@gmail.com and we’ll get you featured on here! If you want to follow more Deaf Traveller adventures, please do follow me on Facebook, Twitter and Instagram. Or you can even sign up to receive emails from this amazing website by going back onto the homepage.